Our 2019 tour kicks off at the fabulous Ashville College in Harrogate, where our audience are in for a treat. Alongside screening some of the best adventure films on this planet, we'll be joined on stage by Kate Rawles. Kate is an outdoor philosopher, writer, activist and cyclist who has just returned from her epic The Life Cycle adventure. Travelling 8000 miles on her home-grown bamboo bicycle from Costa Rica to Cape Horn. Kate uses her incredible adventurous journeys to raise awareness and inspire action on our most urgent environmental challenges. Kate will be bringing her bamboo bicycle ‘Woody’ along to meet you all. Gather your tribe and book your tickets - it really will be a one-of-a-kind evening! Outdoor philosopher, writer, activist and cyclist Kate Rawles is just back from her epic The Life Cycle adventure. Travelling 8000 miles on her home-grown bamboo bicycle from Costa Rica to Cape Horn. The overall goal of her ride was and is to harness the power of adventure in some of the world’s most extraordinary landscapes, in order to raise awareness and inspire positive action on biodiversity loss. Kate is passionate about the need to find urgent, effective and suitably radical responses to our multiple environmental challenges (including giving our values and worldviews a thorough overhaul) – and firmly believes our quality of life can go up rather than down in the process. She’s excited about adventurous journeys as a communication medium and believes the adventure of sustainability is an adventure we’re all on, one way or another. Dr Kate Rawles studied philosophy at Aberdeen University, and environmental philosophy at Glasgow and Colorado State Universities. She was an indoor philosophy lecturer at Lancaster University for nearly a decade before leaving to work freelance in 2000. From 2004-2014 she worked half-time as a lecturer in Outdoor Studies at the University of Cumbria – teaching ‘big picture’ environmental issues, sustainability, environmental education and a bit of sea kayaking – and half-time as a freelance outdoor philosopher, writer, lecturer and environmental campaigner. She left Cumbria University in 2014 to develop her freelance work and plan The Life Cycle. A Fellow of the Royal Geographical Society, Kate is a keen hill-walker and sea-kayaker (with a particular love of remote islands with lots of wildlife) as well as a long-distance cyclist and bookworm. 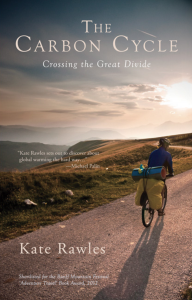 Kate’s book, The Carbon Cycle; Crossing the Great Divide was shortlisted for the 2012 Banff Mountain Festival Adventure Travel Book Awards and was a runner up in the UK People’s Book Prize.